not the best picture...I was in too much of a hurry to eat it !! It's really amazing how all the different experiences you have in your life sometimes intersect, and sometimes food is no different. I've known the difference between real maple syrup and the fake stuff since I was a kid, and have always preferred the real deal. Many years ago I came across a recipe for a pumpkin pie sweetened with maple syrup which has since become a staple of our Thanksgiving table. A few weeks ago - the score of the Grade B maple goodness from Gould's. Just yesterday I had the most amazing pumpkin pancakes with cinnamon whipped cream (see yesterday's mobile post)...and today, while making out my weekly shopping list, I grabbed my Stop+Shop coupon postcard and in addition to my 5% off, I had a coupon for a free tub of Edy's Ice Cream. I've never actually bought Edy's (I'm kind of an ice cream snob) but figured I could at least check to see if they had any good flavors. Turned out they had something pretty interesting - pumpkin ice cream. So in it went. Waiting in line, the wheels were turning...what cool thing could I do with pumpkin ice cream ? How could you make a sundae out of it, hot fudge would be weird, maybe caramel syrup....and then it was like lightning struck. Maple Syrup !! Grade B, even !! 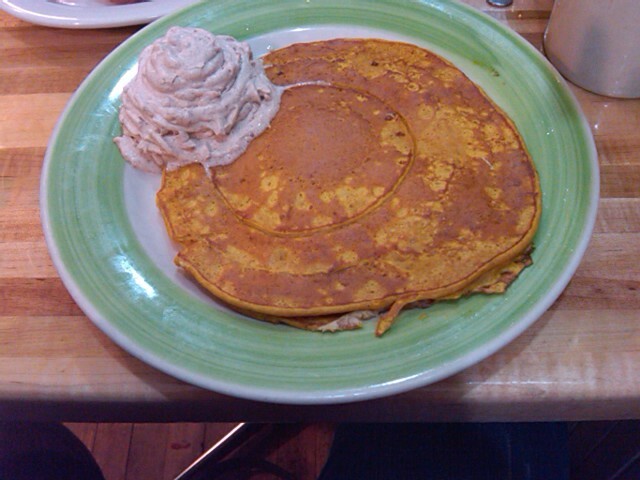 And then...OMG, that cinnamon whipped cream !! But with a tiny bit of nutmeg added...BRILLIANT !!! 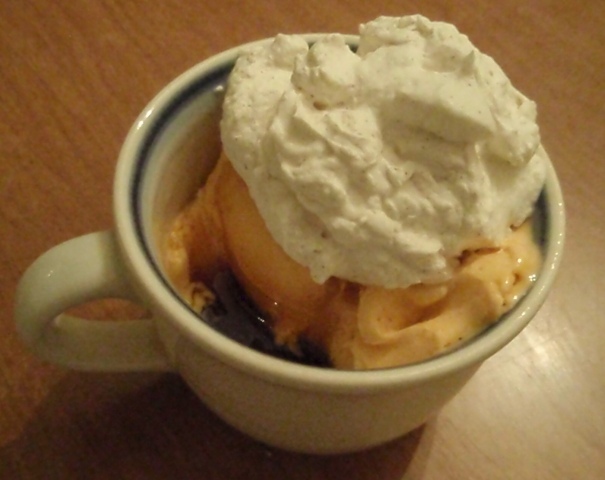 Whip cream to very soft peaks, add sugar and spices, and continue to whip until it holds stiff peaks. In A Pickle, Waltham...omg, yes this place is worth the hype !! Sent from my BlackBerry wireless device. 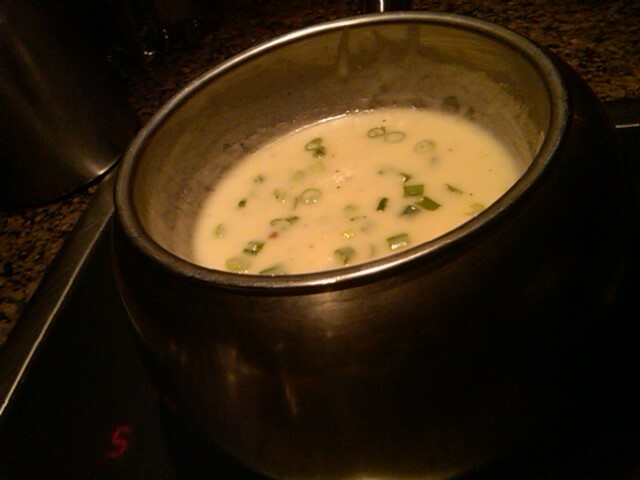 not the best picture...but OMG yum ! Drizzle pears with syrup. Bake in a 375 oven for 30 minutes or so - until soft and golden. Our last encounter with a wild turkey suggested that smoking was definitely the way to go, so that's what Alex requested for this one. (Plus the timing worked out well, since the Pats game was at 4:15 today :) ) Brining is essential...this one was done in an apple cider-orange-spice brine, which worked really well - bird was juicy, all the flavors melded together perfectly. I am soooo into the smoked shrimp, ever since we got the smoker-grill...shouldn't have been a surprise, since I love smoked food and seafood. Seriously, so good. Two side dishes to round out the meal - one was Roasted Sweet Potatoes, using some Grade B Maple Syrup from Gould's. If you've never experienced the deliciousness of Grade B syrup, do yourself a favor and check it out sometime if you get the chance. It's excellent for cooking and baking, darker with a much deeper, stronger maple flavor with hints of caramel. (Unlike, say, meat, Grade A isn't "better", just lighter.) Use sparingly until you're used to it, though ! The other side was a version of a salad I love making in the fall...mixed greens, dried cranberries, glazed pecans are the staples. Cheese is also always in there - usually Gorgonzola, but this time I used the blue from the trip to Smith's a few weeks ago. What an amazing cheese...super creamy with just the right amount with blue. I love throwing pears or apples in , but didn't this time as Mark is not a huge fan of either in a salad...but I did make my very simple homemade balsamic dressing. Drinks were a choice of beer - Harvest Moon Pumpkin, Sam Adams Octoberfest, or Smithwicks - or apple cider (not the boozy kind, for once :) ) . All went perfectly. I so love cooking in the fall !!! Bring the water, salt and sugar to a boil, and simmer until everything is dissolved. Let cool and mix in the rest of the ingredients. Seal turkey and brine in a large ziplock bag, and let it sit in the fridge for at least 24 hours. This is a little different than the version I posted before...mostly because this is what I had on hand :) I also didn't want to make it too spicy....personally I like at least double the chipotle, but the non-spice heads (Alex and the inlaw) were very, very happy with the spice level. Very, very, very good result ! Mix well, and let sit in fridge at least an hour to blend. Melt butter and stir in syrup. Drizzle over potatoes, sprinkle with spices and mix well. Roast in a 350 oven for about an hour, until nice and tender. So super easy to make - and so good - once you start, you'll wonder why you ever bothered with store-bought. Since it only has three ingredients, though, you want to make sure they're the best quality...this is when to break out the good stuff ! Whisk everything together until creamy and lovely and delicious...really, that's it ! Last night, we decided to try The Melting Pot...neither of us had been there before, and we had errands in the area. Plus we're both off work today, so a late dinner worked out just fine. Usually I am not a fan of chains, but enough people had said good things about this one that I was willing to give it a shot. The evening itself was very enjoyable - the atmosphere is great, the booth we were in was really intimate and private, yet elegant. 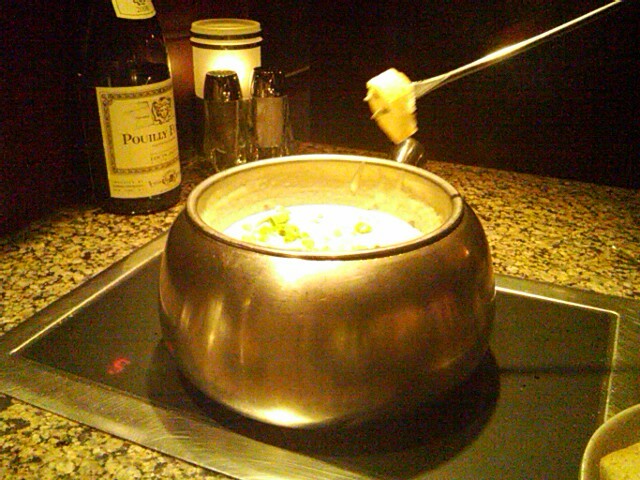 If you're not familiar with The Melting Pot, it's a fondue restaurant - your table has a built-in cook surface, and most of the dishes are cooked in a pot right at your table. Our booth was a cosy corner, high backed, with a curtain you could close for privacy (not that we did, but one could :) ) . This made for a very relaxing meal. And our waiter was absolutely charming and very knowledgeable. The food itself, though...well, it just doesn't cut it for me, foodie-wise. It's pretty pricey (our four-course meal was $86 per couple, plus wine, etc...and that was one of the more inexpensive options). I definitely do not have a problem paying that much - and more - for a meal, but there's much better places to spend that kind of money. It was good, just not *that* good ! The dinner we chose was the "Big Night Out - France"...cheese fondue, salad, main course and dessert. We started with the Fondue A La France - described as " A rich, smooth combination of baby Brie, Fontina, Gruyère and Raclette cheeses accented with Nueske’s bacon, onions, white-truffle cream and fresh chives" This was very good (even though I saw no evidence of bacon) - but I have to say that Sprigs , in Acton, does a Brie and truffle fondue that is so amazingly, orgasmically good that you want to lick the table in case you dripped any. Still, it was a perfectly nice fondue, with tasty bread to dip as well as green apple slices - which I didn't expect but enjoyed very much. There was also a little crock of vegetables - carrots, cauliflower and broccoli - not very fresh, so we didn't eat much of them. This was actually excellent - haricots verts (marinated tiny green and wax beans), tomatoes, hard-boiled egg, and Niçoise olives topped with a tangy Shallot Vinaigrette. There were also some shredded beets, as you can see....I am not a beet fan personally (one of the very few things I don't like), but my dining partner assures me they were just fine. 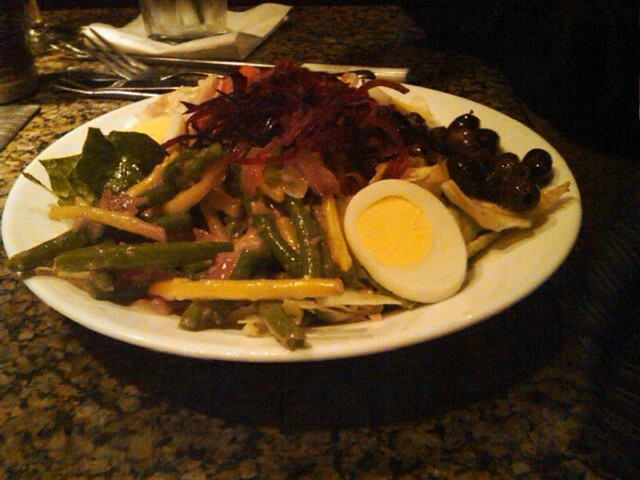 Whatever, dude :) They were easy enough to remove and didn't bother me in the slightest - so really, a fantastic salad. Quite a collection...Filet Mignon, Peppercorn-Crusted NY Strip, Chicken Provençal, Roasted-Garlic Shrimp, Maple Leaf Farms Duck a l’Orange, Ratatouille & Goat Cheese Ravioli, potatoes, mushrooms and broccoli. 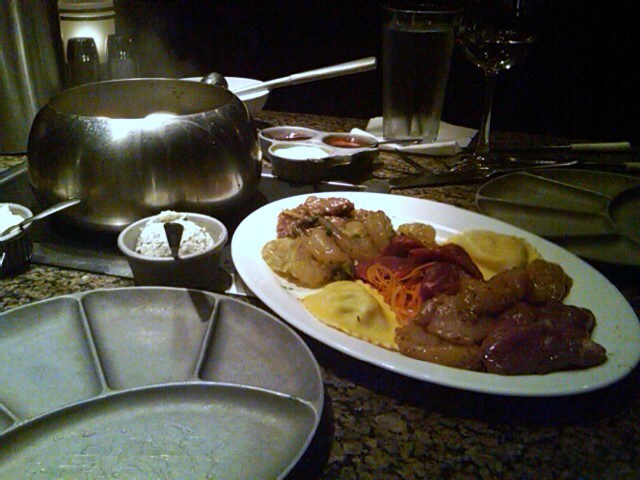 We chose a Court Bouillon for the fondue part...then basically, it was stab and simmer :). Each person gets two color-coded forks, and the items take anywhere from 2 to 6 minutes. Again the vegetables weren't that great - they may need a better supplier - but the other items were tasty. There were a number of sauces, which we tried on everything : a yogurt-based curry sauce, which was quite good and went well on almost everything but the red meat and duck; a gorgonzola sauce, fantastic on the red meat; a Green Goddess (cream cheese, sour cream, onions, chives and parsley) which was great on the vegetables, a teriyaki which tasted like there was port wine and cloves involved - different and quite tasty; and a plum sauce which was way too sweet for us (though some people love it). A great selection and the sauces were fun to try...but for me, nothing that really bowled me over. My partner found the setup a bit too much work - a lot of awkward reaching - and found that the seasoning on the various items didn't really come through once the item was cooked, as everything kind of washes off. I should mention the wine...for the first three courses, we had a bottle of Louis Jadot Pouilly-Fuisse. This has been one of our favorite wines for years...a white, but one with plenty of flavor to stand up to just about any kind of food - but doesn't overwhelm anything. Surprisingly, the huge wine selection is very reasonably priced...shocking given the menu prices, but quite welcome. They also had a very cool looking cocktail menu, which I will go back and test drive at some point. We went with a straight dark chocolate fondue, as we were both in need of stronger libations at that point and wanted something that would go with our choices - Hennessy VSOP for him, Laphroaig for me. Smoky Scotch and chocolate, you ask ? Hells yeah ! It's an amazing combination. The fondue itself was quite yummy, and the dippers were, again, a pretty cool selection : fresh strawberries, bananas, cheesecake, Rice Krispies treats, marshmallows coated with regular and chocolate graham cracker crumbs, pound cake and brownies. The cheesecake wasn't quite dippable, but we drizzled the chocolate on top and it was mmm mmm good :). Rice Krispies treats were a good idea, but these weren't the best version of them so we weren't a huge fan. The marshmallows, however, were a revelation - this is another food item that I'm not the biggest fan of, but they worked fantastically in the fondue. 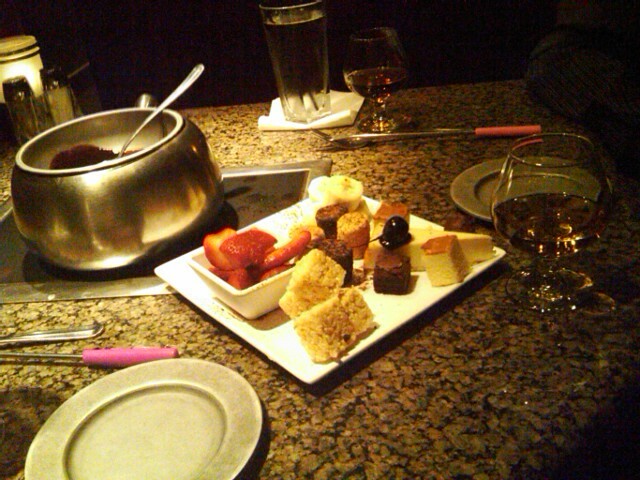 In closing...I think I'd definitely go back to the Melting Pot for drinks, or maybe dessert (actually, they have a cheese fondue-chocolate fondue - bottle of wine special that may work)...but I'm probably not rushing back there for a meal - unless someone really wanted to go. Not fantastic, not terrible...a pleasant experience, overall. 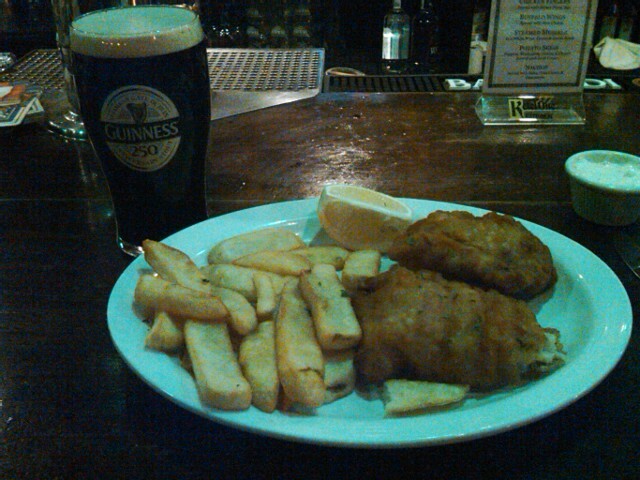 Fish and chips and Guinness at the Skellig...heaven !! This combination is really excellent - the brown rice, butter and pecans compliment the apple cider flavor so well. The only change I made was to the rice - I used frozen brown rice from Trader Joe's. Usually I make my own rice, of course, but this is an awesome thing to have around for a quick meal...it's just plain brown rice, already perfectly cooked, that heats in a few minutes. Dressed up with pecans and browned butter, it's absolutely wonderful. Quick weeknight dinner - under 30 minutes - that meets both my foodie and healthy requirements. Done ! way better than it looks ! The menu : Butterflied Leg of Lamb (hey, had to use the new knife !) stuffed with a leek stuffing, served with a Port-Fig-Balsamic sauce, Roasted Rosemary Potatoes, and Italian-Style Spinach. The problem : the lamb was cooked too low and too slow...so it literally fell apart when we sliced it. The taste was amazing - especially the stuffing, which I will give the recipe for - but I was going for more of a neat slice, with the pretty spiral of stuffing inside. The fig sauce tasted amazing as well, though a little heavy on the fig (two less next time), and I didn't take the time to defat my stock - a more serious error. We will definitely make this one again, and I will post the final recipe. 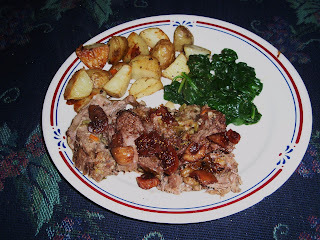 (Potatoes and spinach were delicious - both are recipes I make often). Wine with this meal was a blackberry wine from the Russell Orchards trip - absolutely PERFECT with the flavors of this meal !! Toss all ingredients in a roasting pan large enough to spread potatoes out in a single layer (I use a stoneware baking dish for best results). Roast at 400 degrees for about 45 minutes or so - stir every 10-15 minutes. (test them after 45 minutes - they should be golden on the outside and done completely through - if not, back in the oven they go...timing depends on what else is cooking in the oven). 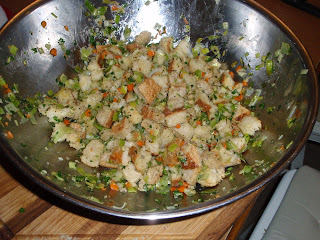 In a large heavy pan, saute garlic in olive oil until just turning golden. Throw in the spinach, cover, and turn heat to low. In a few minutes the spinach will start to wilt...stir it into the oil and garlic and cover again. Cook another 5 minutes or so, until done to your liking. Add lemon juice, salt and pepper and serve. 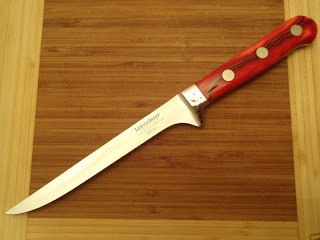 LamsonSharp "Fire" 6" fillet/boning knife....oh yeah baby ! Today's mission : a new knife. ROAD TRIP !!! 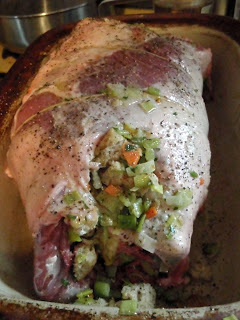 A few weeks ago, we made a boned stuffed turkey breast...which I just realized I never wrote a blog entry about ! Will do that one again sometime...it was soooo good, stuffed with breadcrumbs, apples, onions, rosemary and wine...rolled and roasted. During the preparation, I was informed that our boning knife was no more...I'm not sure how one actually breaks a Wusthof-Trident forged steel knife, but be that as it may, it is no longer in the block. Today was a gorgeous day for a road trip, so we decided to head out. A few weeks before that, we found the Lamson and Goodnow Factory Store in Shelburne Falls...definitely a foodie find, more on that in a bit. First foodie stop, though - Smith's Country Cheese . We had read about this in our Food Lover's Guide mentioned a few posts ago and kept meaning to check it out...locally made cheese definitely sounds like a win. We actually had enough time this trip, so punched it up on Skynet Lady (our GPS) and headed over. Not quite as big as we had hoped, it's basically a gift shop with a fridge case on one side with some cheeses, as well as some local meat products. The Yankee Candle smell (which I usually love) was so overpowering that it was hard to think about cheese. They did have some out to sample, though, and we ended up buying a Smoked Gouda, a Caraway Gouda, and some blue cheese. (Luckily, we know to bring a cooler when we go on these road trips :) ). not a stock Cubano - but awesome anyway ! After our lunch, we walked through the town before driving home (we needed it - those little drinks were potent !) . As this is a foodie blog, I won't blather on about the town here...check out the pics on my Facebook page though - the Bridge of Flowers and the glacial potholes are definitely well worth checking out. Last stop on the foodie tour was Hagers Farm Market, which is right on the Mohawk Trail (Route 2). We had driven by this place a few times on our various Western Mass. road trips, and finally decided to stop. Walked out with quite a haul - local cider, sausages (including lamb sausage, which I can't wait to try), ham, and cider doughnuts....which I will enjoy tomorrow morning after a well-deserved night's rest !